Timely and accurate estimates are critical in the insurance and construction industries. Apex prides itself on thorough inspections and an attention to detail in each scope of work prepared. Accurately reflecting the costs needed to bring a structure back to its pre-loss condition is a crucial component in the claims process. Apex is familiar with the time sensitive nature of the claims process and is prepared to deploy adjuster and experts to any location in rapid fashion. Apex offers emergency services through our relationship with multiple contractors and vendors to mitigate against any additional damages. Fluent in every estimating platform, Apex prepares accurate estimates with the supporting documentation for any type of project. Apex can review submitted scopes from contractors or PA’s and prepare detailed reports reviewing the submitted scope and note any discrepancies. For larger claims, it is imperative to have an accurate initial assessment of damages to set an appropriate reserve level. Apex can have adjusters on site quickly and submit an initial ROM estimate followed by a detailed scope allowing the carrier to accurately gauge the extent of the exposure. Apex can prepare or review water mitigation invoices supported by our extensive experience and credentials servicing water mitigation claims. Apex can provide a carrier accurate ITV calculation report to assist the carrier in both determining coverage amounts and to determining damage exposure. In terms of construction and insurance industries, accuracy and timely estimations play some pivotal roles. Our team from Apex Claims and Appraisal prides in offering thorough inspections with every attention to detail, for the sake of preparing accurate scope later. 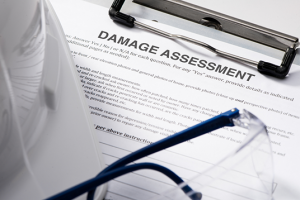 For us, each task of Property Damage Assessment is completely different from what we have handled so far. Therefore, we would like to change our services eventually, to tailor-made clients’ needs and requirements. One crucial part of claim process is reflecting costs accurately, which is needed to get the old structure back to pre-loss condition. Well, we are quite familiar with such sensitive nature of claims procedure and all set to deploy adjuster and even experts to any form of location in lightning fast speed. With us, you can further proceed to get emergency services as we have established thoughtful relationships with vendors and multiple contractors, willing to mitigate against any extra damage. Before you head for our prices and hire our team, we want you to go through the Property Assessment Services we have in store. Repair or reconstruction cost estimation: We are quite fluent in every estimating platform with supporting documentation. Scope analysis: We are down to review submitted scopes from Pas to prepare detailed reports for our clients. ROM: It is mandatory to have accurate initial damage assessments for larger claims, and we have that covered for you. Apart from these tasks, we have Mitigation scope preparation and IT calculations, as some additional bunch of services. So, now you know why you should call us!